The Line’s only 3D Meloplasty facial contouring makes slim and smooth facial lines at from every angle including a 45° angle, front and lateral. This face sculpting surgery not only removes prominent cheekbone, but it forms beautiful facial considering the ratio and harmony of the whole face even the bone contouring. It is also known as face sculpting surgery varies widely. With a scientific analysis using 3D-CT, figure out the three-dimensional structure of muscle tissue/bone tissue/ nerve tissue and vascular tissue around cheekbones for facial bone contouring. As a delicate face sculpting surgery carried out, damage to the nerve tissue and vascular tissue can be prevented in advance. Simultaneously the face sculpting surgery and bone contouring reduces the front cheek/ lateral cheek/ 45° angle cheek which are the main causes of the big cheekbone. It makes cheek line smoother by reducing the high cheekbones and the entire face outline through this aesthetic surgery. In this aesthetic surgery through bone contouring, there is a weakness of conventional surgery with an incision inside oral. It’s difficult to identify the exact surgical area because of the narrow sight. The Line’s only meloplasty is performed extremely safe and accurate by using special face contouring endoscopic equipment that enables real-time understanding of the surgical area’s vascular, soft tissue and bone tissue when inside the oral incision. Personalized meloplasty or aesthetic surgery is performed depending on the prominence of the cheekbones. If not severe high cheekbones, there is a simple-cheek reduction. It’s a new aesthetic facial surgery concept of cheek reduction operating during lunchtime in a half hour. 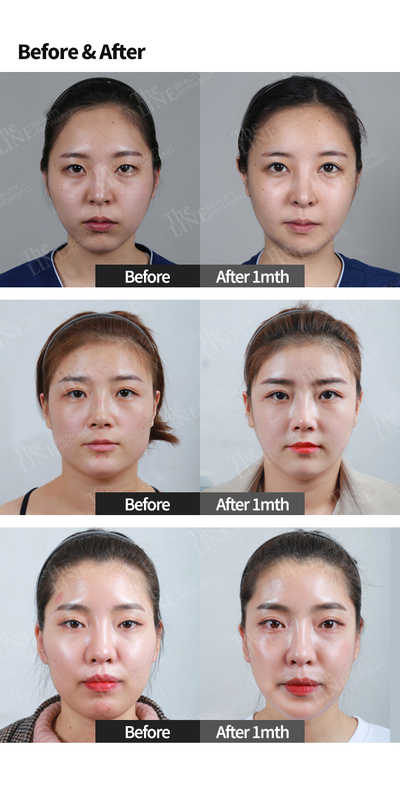 Thorough Preliminary Process of face sculpting surgery: The Line center analyzed each case closely and scientifically through personal diagnosis, actual image diagnosis, and 3D diagnosis for secure and accurate diagnosis. And we prepare the face sculpting surgery through conference by medical professionals in center, after exactly grasping personal facial conditions of bone contouring based on 7,000 times of experiences and know-how. Quick recovery and prevention of sagging cheeks, minimizing exfoliating part, to reduce the damage of muscles and skins surrounding bones in the process of facial bone contouring. Prevention of sagging cheeks making skins adhere and permanent effect through perfect fixing without rocking or herniation of bones. Prevention of sagging cheeks drawing up soft tissues, which were detached during the suture after the cheekbone surgery.